Enjoy a phenomenal display of magic and illusions by the Great Albini in the new slot creation from Microgaming, complete with free spins, wilds, and mystery boxes. You've been invited to attend a magnificent show at the theatre of dreams where you'll get the opportunity to witness the remarkable skills of the Great Albini. He will be joined by his gorgeous co-star Lily as they take you on a magical adventure where you can win incredible cash prizes and astonishing rewards while getting hypnotized by a wide variety of magic tricks and illusions under illuminating spotlights filled with purple smoke for a truly captivating gaming experience. The new game from Microgaming casino software is called The Great Albini slot and it offers a spellbinding gaming experience that plays out over 5 reels with 3 rows along with 25 fixed pay lines. When you claim your no deposit bonus, you will also be treated to a plethora of bonus features, such as a Mystery Box feature, a free spin feature, and wild symbols along with a top jackpot prize worth 1,000 coins up for grabs in the base game. The Las Vegas-style sign, with 'Wild' written across the sign in gold letters, will represent the game's wild symbol, substituting for all standard symbols to generate a win. However, please keep in mind that it will not stand in for the free spins bonus symbol, the Lily wild symbol, or the Mystery Box symbol. It's also worth mentioning that the standard wild symbol will only appear on the second, third, fourth, and fifth reels to help form a win. The poster featuring the Great Albini himself will act as the game's scatter symbol and you will need to display at least 3 Great Albini scatter symbols on the second, third, and fourth reels to receive 12 free spins. During the free spins round, the reel layout will expand in height, providing a staggering 50 pay lines which will assist you in creating massive winning opportunities. Furthermore, you will also have the opportunity to activate the Lily Wild feature during the free spin feature which can be accomplished when you display Lily on reels 2, 3, and 4. Once triggered, Lily has the power to expand across an entire reel where she will act as both the wild symbol and a 2x multiplier. She also has the power to reward you with re-spins until you are unable to generate winning combinations on the reels. Should you be impatient and would like the free spins round to be activated immediately, you are more than welcome to buy 12, 10, or even 8 free spins thanks to the orange box that is situated on the control panel. However, please be aware that it will cost you 150x, 125x, or 100x your total bet to activate the free spin feature immediately. Microgaming's new Great Albini slot also boasts with a captivating Mystery Box feature which you can activate when you display a fully stacked mystery symbol on reel 3. Once activated, you will be awarded 3 re-spins. During the re-spin feature, the mystery boxes that activated the feature will be frozen in place. If you are able to display additional mystery boxes, the new boxes will also be frozen in place while the respins will be reset as well which means you'll start over with 3 re-spins. After the re-spins are completed, the mystery boxes will change into a standard symbol to hopefully offer a lucrative win. 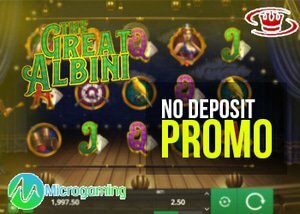 The new Great Albini slot from Microgaming offers 25 fixed pay lines and although you won't be able to alter this in any way, you still have loads of flexibility when it comes to betting possibilities. You can start your enchanted adventure from a mere $0.25 on a single spin or increase the total bet value up to $50.00 on a single spin to unlock phenomenal rewards. With your Microgaming no deposit bonus, you will also be greeted by an incredible variety of theme-related symbols to boost your bankroll during the base game. The Great Albini will provide the largest jackpot prize of 1,000 coins when you manage to land five on a winning payline. You will also be welcomed by Lily, the beautiful co-star of the Great Albini, lucky cups, a set of sharp knives, and a yellow canary. In addition, you can form smaller wins by utilizing the lower-valued symbols consisting of orange tens, green jacks, purple queens, blue kings, and red aces. Microgaming's new The Great Albini slot offers a 96.60% payout ratio and is considered a medium volatility slot. You can play it at Win Paradise Casino where you will be awarded $35 absolutely free. New players will also be entitled to a 5-tier welcome bonus along with 25 free spins to ensure you get a red-carpet experience the moment you make your initial deposit. Terms and Conditions apply.